Fee: $23/$18 members - includes an autographed paperback copy of The Gown: A Novel of the Royal Wedding, refreshments, and admission to the sculpture garden (come early to stroll the grounds). Register online or by phone at 414-446-8794. 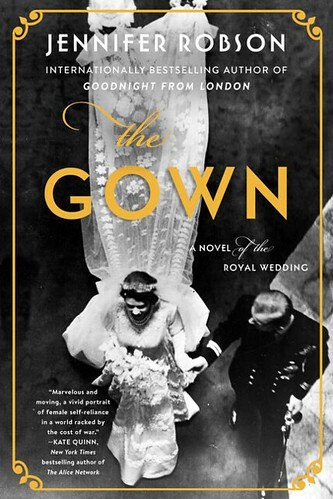 Lynden Sculpture Garden's Women's Speaker Series and Boswell Books welcome Jennifer Robson, author of The Gown: A Novel of the Royal Wedding, back to the Lynden Sculpture Garden, Monday, May 6, 7 pm. For more information on upcoming Women's Speaker Series Events, click here. Though the war ended two years ago, England’s recovery has been difficult. But the nation’s spirits are lifted when Buckingham Palace announces the engagement of Princess Elizabeth to Lieutenant Philip Mountbatten. For Ann Hughes and Miriam Dassin, colleagues at the famed Mayfair fashion house of Norman Hartnell, the upcoming wedding is more than a celebration. The talented embroiderers have been chosen to create the beautiful, intricate stitching that will adorn the royal bride’s wedding gown. It is an extraordinary opportunity for an ordinary working-class English girl and a French émigrée who survived the Nazis. Intrigued by the exquisite set of hand-stitched flowers she has inherited from her late grandmother, Heather Mackenzie discovers the embroideries match the motifs decorating Queen Elizabeth II’s stunning gown from her wedding almost seventy years before. Among her grandmother’s possessions, she also finds an old photo of Nan with Miriam Dassin, a celebrated artist and Holocaust survivor. How did her beloved Nan, a woman who never spoke of her old life in Britain, come to possess these embroidered treasures? What was her connection to Miriam Dassin, and why did Nan never mention her? Yearning to know more about her grandmother’s past and the mystery of the embroideries, Heather travels to London. It is a journey that will unlock the secrets of Nan’s life, including her connection to Miriam, and may even lead Heather to her own destiny.